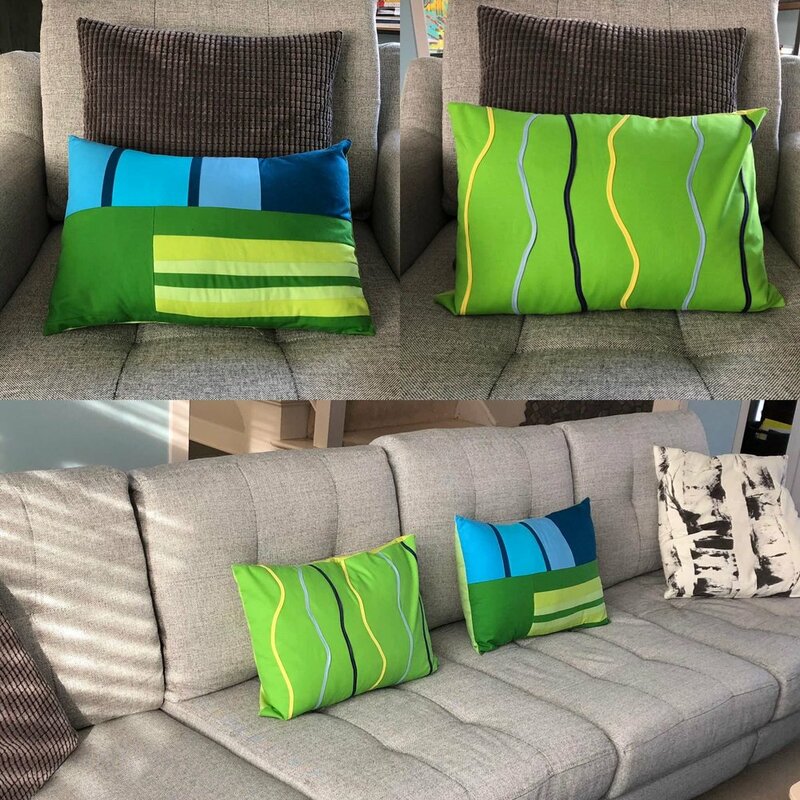 Contours pillow on the left with bias tape. Summer Prairie pieced in blues for they sky and greens for the grasses on the right. The Art Demo at Brushwood last week was great fun. I set up a table with a donated Singer machine available for hire at Brushwood Art Supply Exchange (BASE) along with all my supplies. Before the art demo, I created an example pillow cover with a pieced pillow top in blues and greens reminiscent of our backyard prairie in summer with a bright blue sky above. I call it Summer Prairie. First step during the Art Demo, I found bias tape in the BASE collection in colors to go with my green fabric I brought for the pillow top. I drew the basic design in my sketch book and started to sew. I wanted curvy vertical lines in different colors. To do this, I started at the top of the pillow top fabric and free hand curved the bias tape a few inches at at time and just sewed it down unto the pillow cover top. Bias tape by definition is stretchy because it is cut on the diagonal bias of the fabric so it was easy to make curves in any direction. I tried to mix it up with my directions of the curves to make it more interesting. Then I sewed the next strip of bias tape until I was at the edge of the fabric. I used a medium grey thread as a neutral to fade into the actual colors of the bas tape. I call this pillow top Contours. I had a great time talking to the Open House attendees about creativity and the potential of using your imagination and the BASE supplies to get into the creative flow. We had people of all ages starting at 6 years old. She had already completed a sewing project at home. Impressive. My fellow Art Demo artists were fascinating and will offer interesting workshops as well, like Creating With Earthen Elements taught by Anni Schwabe. I am even more excited about the potential of BASE after this Opening House event. BASE will be a creative space to hang out and just get into the creative flow. I plan to offer 2 different workshops opportunities for this upcoming Fall of 2019. I created a document with 10 steps to make a pillow cover. Email me if you want a copy. Interested in hearing more about the workshops? Email me to make sure I update you on the upcoming workshops dates and times. Another exciting development: I sold the British Sunset artwork to a fellow quilter through Instagram, Jennifer of @jplasha. She saw the artwork in my post and said if I ever wanted to sell it, she was interested. I sent a PayPal link and it was so easy. We both share a love of sunsets. I offered her the opportunity to come up with a custom name for the artwork and created a label, packed it up and shipped it on its way. She did a great job with the big reveal when she received the artwork and shared it on Instagram. Click @jplasha to see. She is a long arm quilter so check out her Instagram to contact her if you need some help quilting one of your projects. If you are interested in purchasing any of the artwork I show in these Studio Notes, it can be so easy to purchase. Send me an email and I will take it from there.